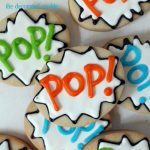 Bite-size superhero cookies are a fun decorated cookie idea for a superhero party or your superhero fan. 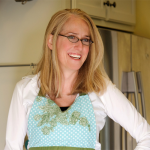 I’m knee deep in planning lots of Sugarlicious events! 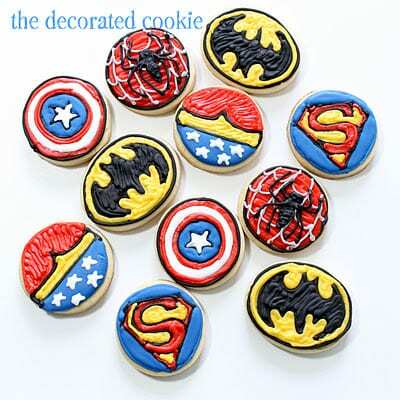 But I’m taking a break to share these little superhero cookies. Even though I pretty much always feel like I’m 13 (in that awkward middle school kind of way), I’m definitely well into grown-up territory where gift-giving becomes difficult. Everyone already has everything they need and if they don’t, they tend to buy it themselves. So each year for my brother’s birthday, I send him cookies. I think it works out well for both of us. And it isn’t too difficult to pick a theme. Superheroes and Star Wars tend to reign supreme. I’m sure his interests are much more developed and varied, but I don’t know what heroes rule the cartoons in the year 2012 and I don’t know what modern movie rivals Star Wars (really, can anything? ), though my brother surely does. So I play it safe and stick with the more long-standing passions. I’m always a fan of bite-size cookies. Something about the cute factor? Or portion control? These shown are only about two inches. And just in case you’re not up on your Superheroes, these are supposed to be Batman, Superman, SpiderMan, Wonder Woman (for my nieces) and Captain America. I remember my brother once saying that SpiderMan was his favorite Superhero, of course, because “he’s the most realistic.” Aah, brothers. 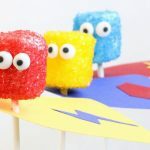 If you like these, you’ll love these easy superhero marshmallows. 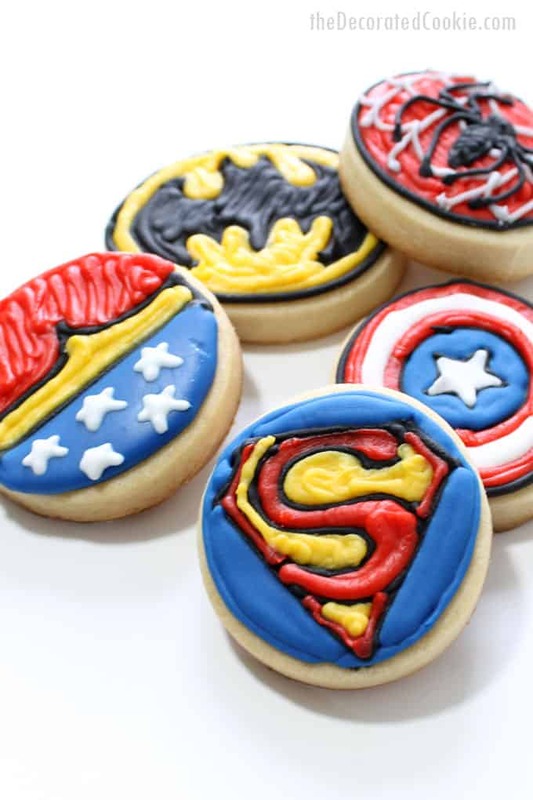 Or check out this roundup of Wonder Woman food ideas. 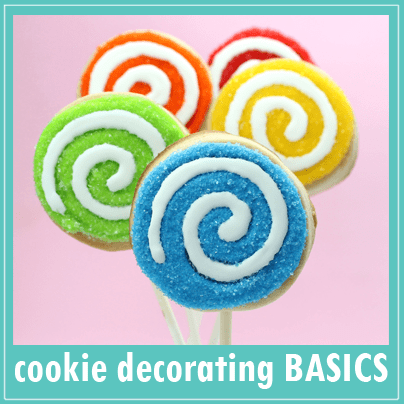 *For tips on finding cookie decorating supplies, click here. For BASIC COOKIE DECORATING instructions, click here. 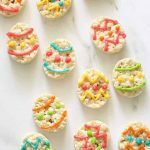 Prepare cookie dough, chill, cut out circles, bake, and let cool. Prepare the royal icing and divide. Tint red, black, yellow, white, and gray (just a drop or two of black coloring). 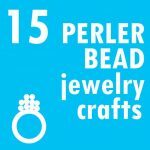 Prepare decorating bags with couplers and tips, fill with icing, and close tightly with rubber bands. Outline the belt with the black with a 2 tip. Let set. Pipe to fill the top with red, the belt with yellow, and the bottom with blue using size 3 tips. Pipe white stars on top of the blue with a size 2 tip. Outline the cookie with the black. Pipe and fill the bat with black. Fill in the circle with yellow. Outline the cookie with black. Pipe to fill with red. 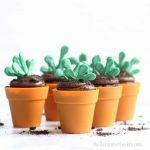 Pipe the web using a 2-tip gray icing. Pipe the spider on top with a black 2-tip. Pipe an outline on the circle cookie, another circle in the center, and the star in the center. Pipe two rings with red. Pipe inside the rinds with white and fill in the star. Fill in the rest with blue. Pipe the emblem with black using a 2-tip. Pipe just inside the emblem with a red 2-tip. Fill the “S” with red, and the rest of the emblem with yellow. Fill the rest of the cookie with blue. Aww! Happy Birthday to your brother. 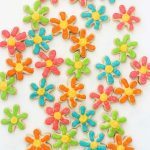 The decorating of these cookies, being only 2" must have been painstaking but they sure turned out wonderfully. I'm sure you and your entire family are getting so excited for the release of Sugarlicious! 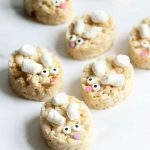 Those are too cute to eat. 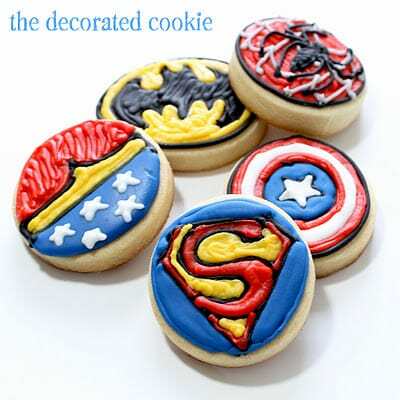 My house is full of super hero lovers, and they would love these! Those are super super cool! Love em. Love these! I have a few boys (big and small) who would looooooove these! 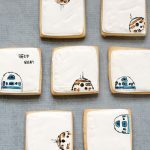 I love little cookies, I think about the portio control.My little Godson would love these cookies. happy birthday to your bro! love these and so would my crew around here!! What a sweet sister you are. I'm sure your brother loves getting his birthday cookies. These are super cute!! My husband would totally love these! I fancy myself wonderwoman….I like her outfit. When I was like 9 or 10 I got wonderwoman undershirt and underwear for Christmas. I thought I was a badass….little did I know I was NOT. Amazing how so many houses are filled with Superheroes admirers! Trish–I always, always, always wanted wonder woman underoos when I was a kid and, sigh, I never got them. So deprived! I love these! Makes me wanna try mini cookies too! You are awesome. Your cookies are amazing! 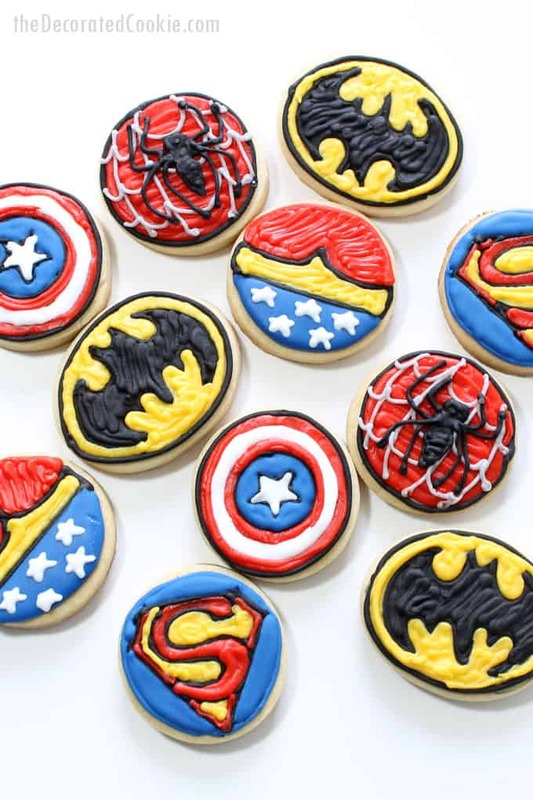 I want make these cookies please!!!! are beauty!!! I have a friend that Im sure will love so much!!! So excited about your site. Love the BATMAN cookie especially for my nephew.